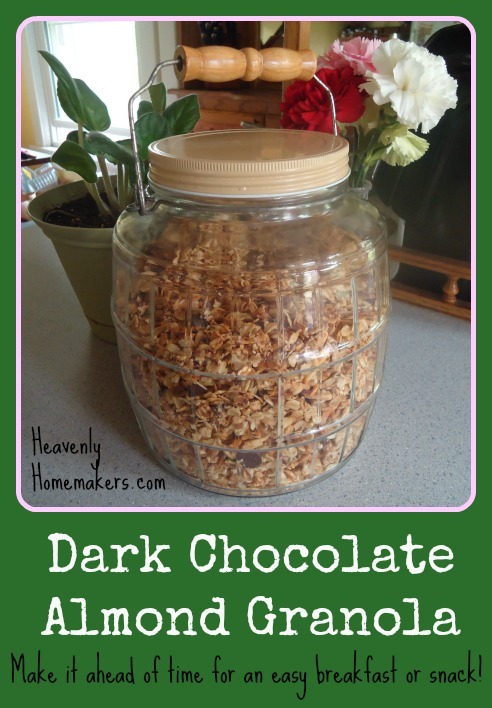 Dark Chocolate Almond Granola – Quick! Make this before it gets too hot outside! First, many of you are thinking, “What do you mean before it gets too hot outside? It’s already too hot outside!” And second, do you want to see my awesome new jar?? I washed it up, and have used it to store many treats. The latest? Dark Chocolate Almond Granola. Which leads me back to my original statement: You really should make this before it gets too hot outside. See, at my house, it’s finallllllly warming up and staying warm (I hope). This is making me so happy!!! It’s also making me think about foods that require an oven and how I will not want to be using the oven much in the near future. These thoughts are what led me to ask my 14 year old to make a double batch of Dark Chocolate Almond Granola earlier this week. How nice to get this made ahead of time! We baked it on a day it wasn’t too hot, and we can eat it on a day that is too hot. And it looks so pretty in my new, old jar. Don’t you think? One thing to consider: The pieces of chocolate in the granola will get pretty soft if (when) my kitchen gets too hot. I may need to store it in the fridge. On the other hand, melted chocolate all over granola is not a bad thing. So, Dark Chocolate Almond Granola. Make some before it gets too hot. Enjoy it on a morning you don’t have time to cook breakfast, it’s too hot to cook breakfast, or you just have a hankering for chocolatey almond goodness. Find the recipe here. This recipe is also included in our free Healthy Breakfast Made Simple eBook. Head on over and download it for several more easy, healthy breakfast ideas. Have you made this recipe before? Is it hot at your house yet? Do you love my new, old jar? This is my husband’s new favorite crunchy granola! He was so proud of it he took a box of it to work to share as a snack in the office. I leave the chocolate out and just add it to my bowl when I get the need for chocolate. My kids love it with yogurt and fruit, even thebones who dont like granola bars. We love this stuff. I’m not big on honey (except in baked goods) but it tastes wonderful in milk. So then I tried it with maple syrup, YUM, but oddly enough I don’t like it as well with milk. Thanks for the recipe, we use it all the time as a snack and in yogurt. I DO love your old new jar! They are the coolest! I have some old green and blue Mason jars that I love to use, as well as an antique butter churn that works great! I can’t say that it’s too hot yet as we just hit 70 degrees and had snow just last week. The trees hesitated to open their leaves until just a couple days ago, but now everything is so beautiful and green! Thanks for the recipe– my husband will love it! I’ve been looking up recipes for cooking granola in a slow cooker. Planning to try it with my next batch. Should help not to heat the house so much and makes it easier not to burn it. Which shouldn’t be difficult anyway but… It happens. I tend to only use the oven in the mornings in the summertime. Yes, I guess you could say it’s already hot. Our house has been in the 80s. That’s inside. I don’t have an outdoor thermometer. I think it would just depress me. lol! YUMMY! thank you for the recipe, we have been enjoying it all week.